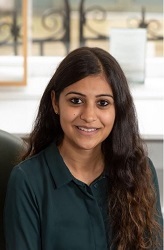 The winner of the 2019 Deborah Rogers Foundation (DRF) David Miller Bursary is Prema Raj, rights assistant at AM Heath Literary Agents (pictured). The prize was awarded yesterday at a ceremony in the offices of Rogers, Coleridge & White in London. Andrew Franklin (chair of the judges) introduced the three shortlisted applicants after which Lord Berkeley of Knighton (chairman of the Deborah Rogers Foundation) announced Raj as the winner and presented her with a cheque. The two runners-up were Camille Morard and Hana Murrell; they each received a cheque for £250. The DRF David Miller Bursary is the second initiative of the Deborah Rogers Foundation. £10,000 is awarded to an ambitious and talented publishing professional, who has been working in either a literary agency or the rights department of a publishing house in the UK for at least two years, in order to give them the opportunity to spend eight weeks with publishers and agencies in a number of countries, thus broadening their experience at a significant stage in their career. The judges of the 2019 DRF David Miller Bursary Award were: Andrew Franklin, chair (managing director of Profile Books), Sam Coates (winner of the inaugural 2017 DRF David Miller Bursary), William Fiennes (author and co-founder of First Story), Hannah Westland (publisher of Serpent's Tail) and Rebecca Servadio (partner at London Literary Scouting). The following international publishers and agencies have confirmed their willingness to work together with the DRF in sponsoring the new Bursary Award winner: Editorial Anagrama (Spain), Big Apple Agency (China), Capitana (Norway), De Bezige Bij (Holland), Giulio Einaudi Editore(Italy), Eric Yang Agency (Korea), Faber & Faber (UK), Fritz Agency (Switzerland), Farrar Straus and Giroux (US), Gallimard (France), Grove Atlantic (US), HarperCollins Inc (US), Hayakawa Publishing Corporation (Japan), Inkwell Management (US), Penguin Random House (UK), Profile Books (UK), Minumsa Publishing (Korea), Rosinante (Denmark) and The Agency (UK). Franklin said: "Rights is sometimes a neglected area of publishing but the international rights teams of publishers and literary agencies are the glue that sticks together our world of publishers and authors. So it is really fantastic that the Deborah Rogers Foundation created this bursary to showcase the best of the best. As with the first award, granted in 2017, the calibre of all the candidates is extraordinarily high. And the winner is nothing short of amazing. We are delighted to recognise what Prema Raj has already achieved and her ambitions for her future." Gill Coleridge, of Rogers Coleridge & White and director of the Deborah Rogers Foundation, said: "One of Deborah's defining qualities was her total commitment to supporting and nurturing those with talent, whether a new author or someone within the agent and publishing community. Selling and managing rights is at the heart of our business so we set up this Bursary to help young professionals who are already working in this field develop their contacts and understanding of international publishing at a crucial point in their careers. "We are delighted by the response to this second Bursary Award and I know David Miller - who helped launch it and whose name we have now attached to it - would be too. We have a very deserving winner out of a strong shortlist and I wish Prema a very exciting and rewarding time over the coming months. We greatly look forward to hearing about her experiences."